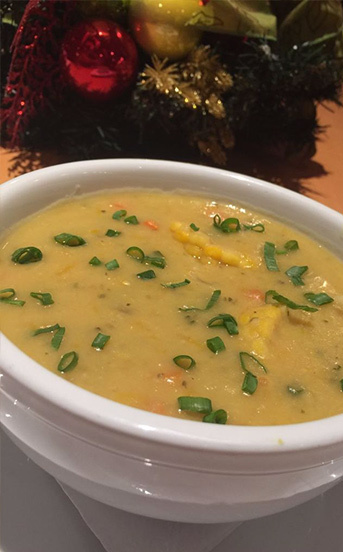 We have developed a menu that mixes international style and quality, with subtle local touches and flavors. All Prices are subject to 12.5% VAT and 10% Service charge. delicate rice paper rolled around diced shiitake mushrooms, carrots, rice noodles, green onions, red and yellow peppers, mint, basil and poached shrimp. served chilled with asian-cilantro dipping sauce. a basket of our char grilled babies, basted in a classic BBQ sauce of our homemade sticky honey garlic sauce. oriental styled dumplings stuffed with Chicken, delicately grilled and served with our homemade sweet soy dipping sauce. warm crisp tortilla chips with our homemade chunky guacamole and fresh pico de gallo. topped with melted cheddar, onion, bacon and our BBQ sauce. flash fried and served with our homemade marinara sauce. spinach, shallots, truffle and manchego cheese, served bubbly hot with tortilla chips. made with our unique lump crab filling and serve with a sweet miso soy. 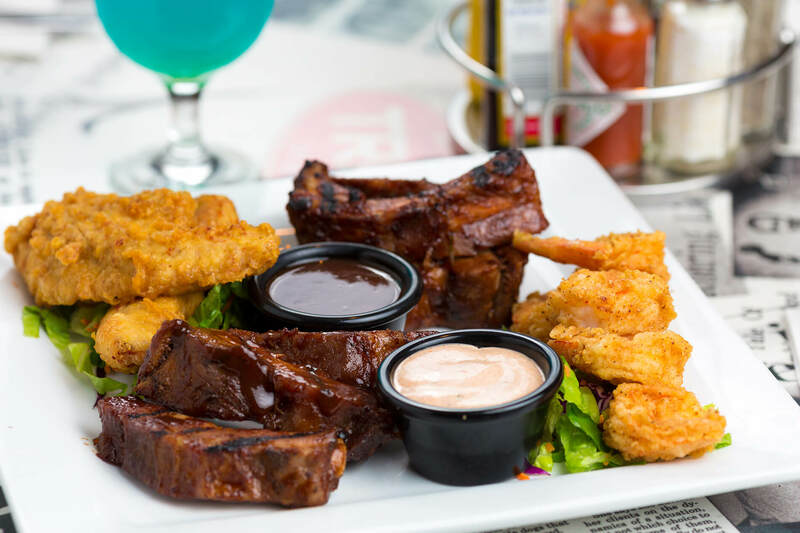 jumbo cajun fried shrimp, baby riblets and goldfingers with dipping sauces. delicious rough cut sweet potato fries served heaping in a basket with our famous cilantro aioli. jumbo shrimp dusted in our homemade cajun seasoning and deep fried. served with spicy remoulade. 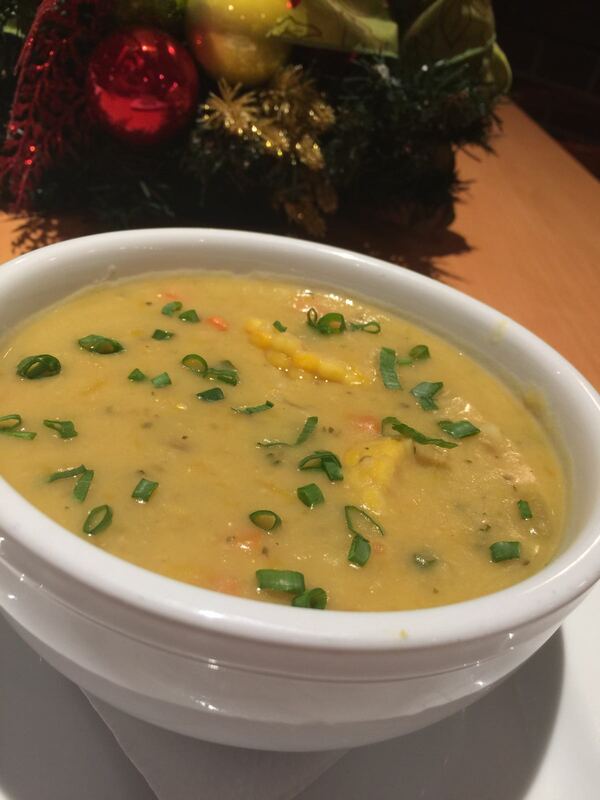 delicately seasoned chunks of local shark, fried to perfection served with a mango chadon-beni dipping sauce. stuffed with chicken, red onions, corn, black beans and pepper cheese, then crispy fried and served with an avocado-cream sauce for cooling. juicy white meat ‘popcorn’ chicken deep fried and served with a creamy sweet mustard. crisp tortilla chips piled high and topped with seasoned beef, melted cheese, shredded lettuce, diced tomatoes, onions, jalapeno slices, sour cream and fresh guacamole. certified angus ground beef, lots of melted cheese, pickles and grilled onions rolled in a crispy wrapper. dusted in seasoned flour and dipped in our tempura batter then fried till golden brown and drizzled with sriracha honey dressing. marinated grilled eggplant, zucchini, squash, black mushrooms, fried plantain, cream cheese rolled in seaweed and flash fried, drizzled with honey wasabi. spicy fried chicken filets on mini buns with cajun mayo, lettuce and fried jalapeno sticks. spicy crab, carrots, cucumbers, cream cheese, black mushrooms and toasted sesame seeds rolled in seaweed and flash fried. drizzled with honey wasabi and spicy sriracha cream topped with signature asian crab slaw. crisp romaine lettuce, thick cut croutons and shaved parmesan tossed in our authentic caesar dressing. 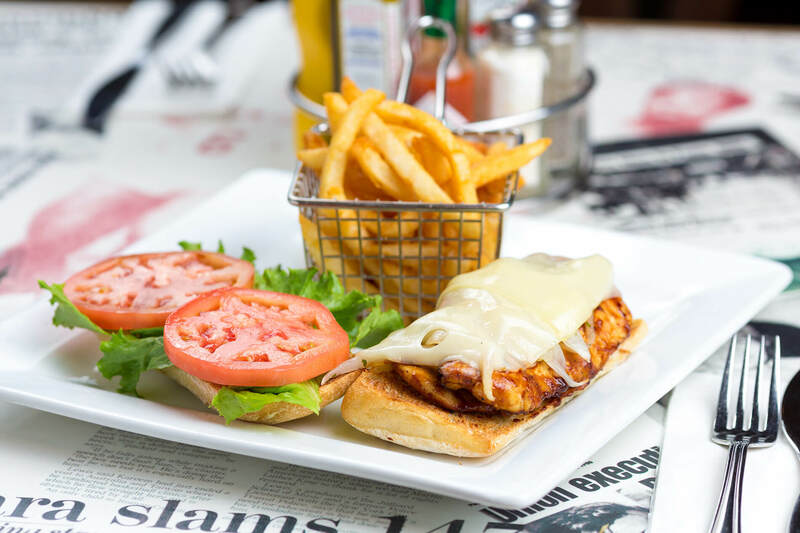 BBQ chicken, corn, black beans, fresh cilantro, shredded cheese, tomato and chopped lettuce all tossed in our herb-ranch dressing and garnished with tortilla strips. 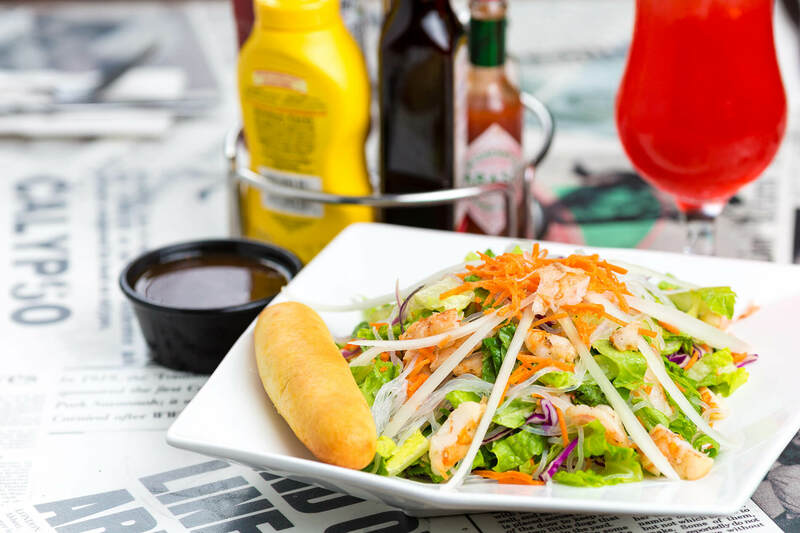 abundant traditional tossed green salad topped with juicy char grilled chicken breast, served with your choice of dressing. lines of chicken breast, blue cheese, bacon, tomato, egg and red onion explode into a bed of mixed greens served with our honey mustard vinaigrette. crispy greens, onions and tomato topped with our crunchy popcorn chicken served with sweet honey mustard dressing. shredded lettuce, crunchy rice noodles, diced grilled chicken breast, red cabbage, julienne carrots and scallions in our tangy oriental dressing topped with sesame seeds. mixed greens, red cabbage, crispy rice noodles, calamari and sesame seeds tossed in our sesame-tamarind dressing. made famous by movie stars! crisp romaine tossed in our homemade caesar dressing in our homemade caesar dressing and topped with crunchy foccacia croutons, boiled egg and a chilled lemon and dill poached salmon filet. delicious and heart friendly. artisan lettuce mixed with cucumbers, tomatoes, red onion, kalamata olives tossed in a creamy balsamic and feta cheese vinaigrette and topped with a chilled blackened salmon filet. strips of southwestern style fried chicken breast tossed with fresh greens, sweet corn, red onions, tomato and jack cheese served with our homemade ‘cajun’ honey mustard dressing. grilled chicken, red onions, cilantro and mozzarella cheese. 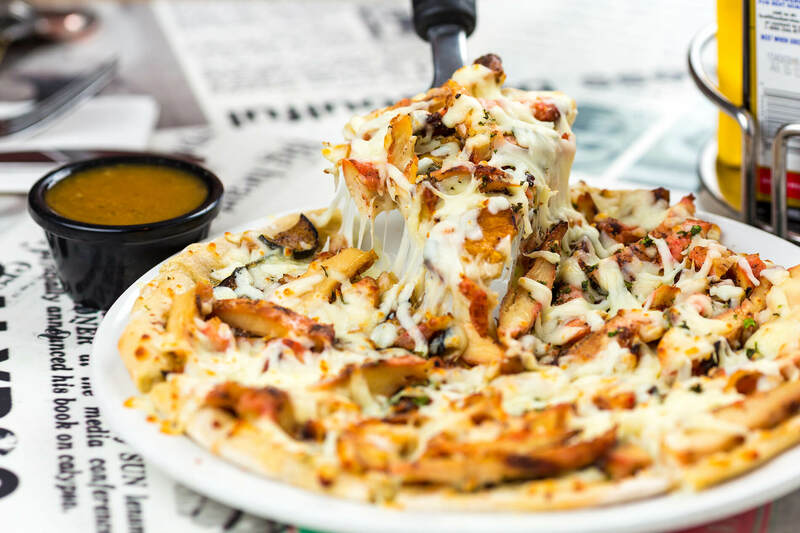 we add fresh roasted garlic, pesto sauce and two different cheeses to this classic. mozzarella, homemade tomato sauce, fresh basil and fresh tomatoes. Cuz we like it SWEET! Pepperoni, sliced pineapple and homemade marinara topped with authentic mozzarella cheese. grilled shrimp and lump crab meat with marinara sauce and mozzarella cheese. classic blend of marinara and pesto sauce with sliced chorizo, pepperoni, irish garlic sausage, mozzarella cheese and chopped basil. topped with thick cut roma tomatoes, red onion, basil, garlic and olive oil. 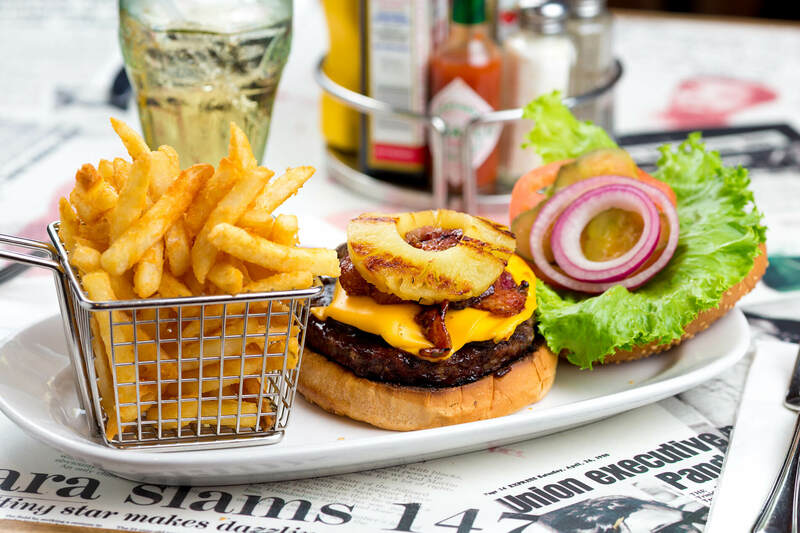 Now nationally famous, our Burgers are all flame broiled 1/2 pound Certified ANGUS BEEF served with TROTTERS Fries. crispy bacon and fresh crumbled blue cheese. swiss cheese, jalapeño and guacamole and alfalfa sprouts. sautéed fresh mushrooms and mozzarella cheese. our classic basted in ‘mahogany’ BBQ sauce, melted cheddar cheese, crisp bacon and sautéed onions. crispy bacon, sautéed fresh mushrooms and cheddar cheese. 100% fresh ground lamb with jalapeno peppers smoked cheese, feta cheese, julienne red cabbage and radish, served on a toasted brioche bun & presented with french fries and mint yogurt. 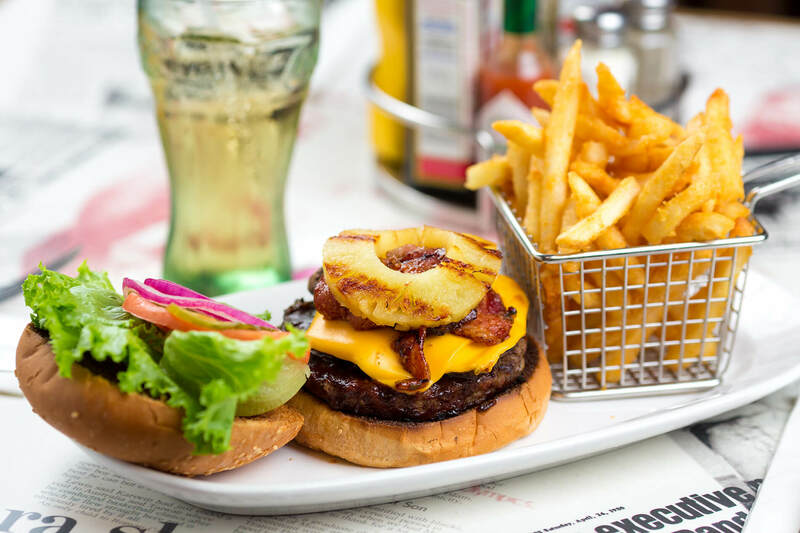 the original chop-house style burger with choice of cheese. our classic cheeseburger topped with lean crisped bacon and a delicious sunny side up egg. twin angus burgers – one layered with mushrooms and swiss cheese the other with cheddar and crisped bacon. then topped with a sunny side up egg and crunchy potato sticks. giant panko crusted portabella mushroom cap, topped with grilled red onion, jack cheese, alfalfa sprouts and roasted garlic mayonnaise. We use imported, plump wings and drumettes, juicy and tender! Tossed in housemade honey garlic marinade and sprinkled with sesame seeds. Just the way you like it, with blue cheese and celery sticks. Golden BBQ with a spicy tang! Formerly known as 375 this time they’re even HOTTER and you know why!! marinated chicken wings in a blend of massala, geera, shandon beni, roasted pimentos and garlic served with fire roasted coconut chutney. tender fried chicken strips wrapped with crunchy lettuce, diced tomatoes shredded jack cheese and our homemade spicy chipotle mayo. tender slices of new york strip steak sauteed with onions, assorted bell peppers and fresh mushrooms then smothered with mozzarella. pan seared cajun spiced mahi filet with sweet corn, bell peppers and onions served with crispy fries or salad. our famous grilled angus burger dipped in our classic BBQ sauce, with sauteed onions, crispy bacon, melted cheese, diced tomatoes, onions and pickles stuffed into 3 tacos skins served with french fries. three soft flour tacos filled with your choice of chicken, steak or shrimp, caramelized onions and cheese, served with shredded lettuce, sour cream, guacamole and pico de gallo. 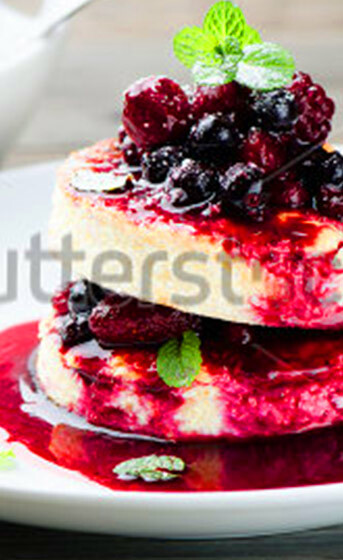 serve with rice and black beans. by popular demand our famous shark sandwich done in a warm wrap and served with sweet potato fries. 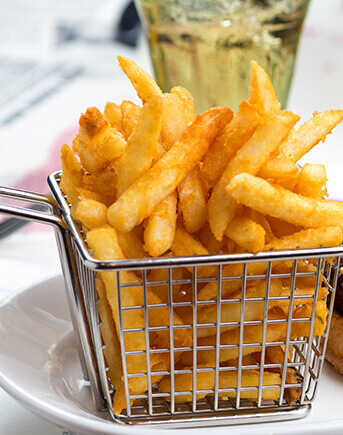 All our sandwiches are served with your choice of TROTTERS FRIES or a heart healthy side salad. served on toasted ciabatta bread with garlic and tamarind-ginger sauces and a fresh chopped salad. served with lettuce, tomato and our basil-honey-mustard dressing. lean, delicious and healthy. crispy spiced chicken breast covered with melted cheese and chipotle pepper mayo. delicious grilled chicken marinated in our homemade jerk seasoning served with sweet potato fries. tender all white meat chicken breast covered with melted swiss, grilled red onion and our mahogany BBQ sauce. deli turkey, crisp bacon, and sliced egg makes this the real deal! deliciously crunchy buffalo chicken breast layered between blue cheese crumbles and blue cheese dressing set atop ripe tomatoes and crisp lettuce. smoking! fresh blackened mahi filet, pan-seared and served with our own cilantro aioli. FISH AND CHIPS BRIT STYLE! hand battered crunchy fish, hot crispy steak cut chips and mushy peas served with house made lime-tartar sauce. hand dipped chicken breast tenders, deep fried to a golden brown and served with crispy fries, sweet cajun dipping sauce and a side of homestyle slaw. the best fingers in town! 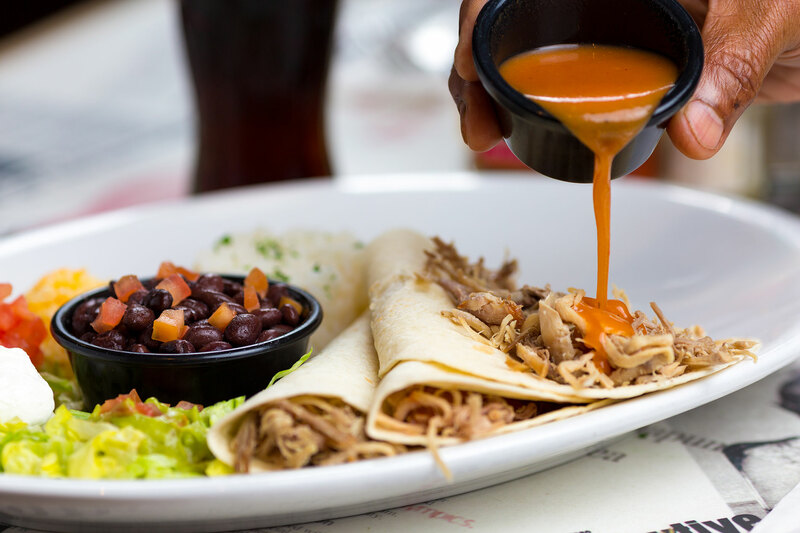 gigantic, warm tortilla stuffed with your choice of grilled steak, chicken or shrimp, seasoned rice, refried beans, cheese, onions, peppers and guacamole topped with a spicy roja sauce, sour cream and garden salsa. caramelized onions tops this cayenne, olive oil and dijon mustard salmon filet served with vegetables sauté and mash potato. 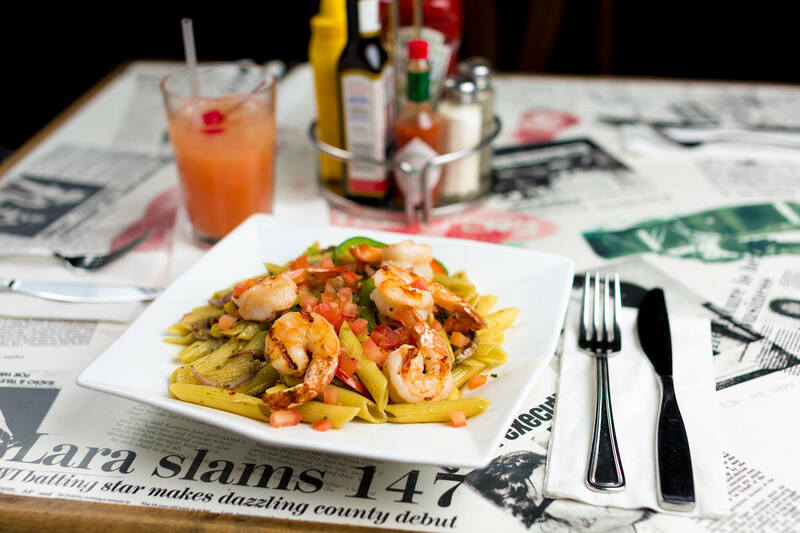 delicious garlic cream fettucine tossed with crabmeat, fresh mushrooms and jumbo grilled shrimp. 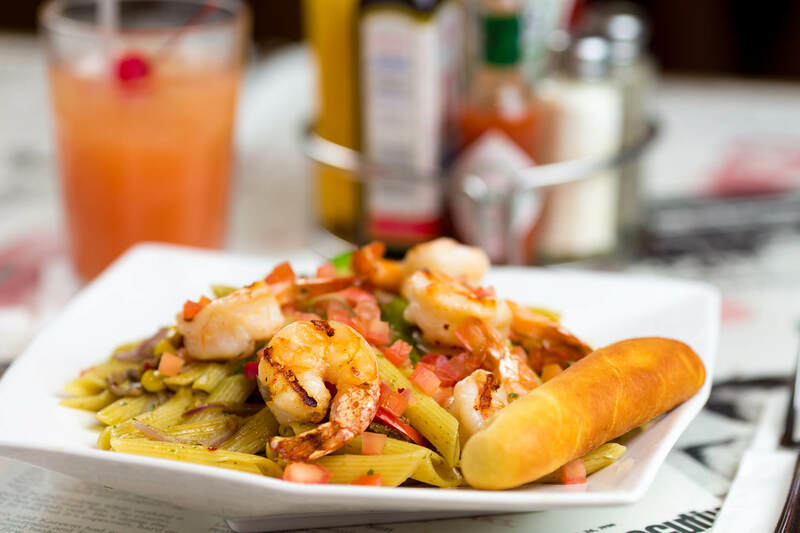 jumbo cajun shrimp, butterflied and hand-battered served with fries and homestyle slaw. linguine tossed in our fresh garlic cream sauce together with button, portobello and cremini mushrooms-infused with a gentle hint of truffle. sautéed jumbo gulf shrimp in a spicy jamaican jerk sauce, served with rice, black beans, plantain and a cooling pineapple relish. a spicy, thai inspired marinade flavored with curry, peanut, chili and coconut sautéed with vegetables and served over jasmine rice. awesome! linguine tossed in a thai inspired peanut sauce together with scallions, bamboo shoots, red chillies and chicken. topped with crushed peanuts and bean sprouts. crunchy fried chicken breast drizzled with truffle-honey, served with sugar snap peas and mash potato. cubed tofu infused with a red thai curry and coconut sauce with bell peppers, onions, baby corn, mushrooms and served with jasmine rice. Perfectly cooked penne pasta tossed in our tomato herb cream sauce, chopped tomato and fresh mushrooms. 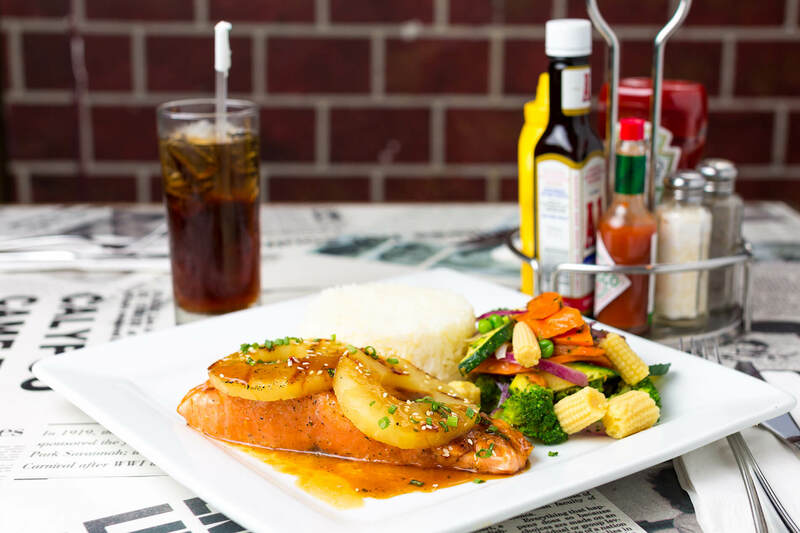 delicious atlantic salmon filet char-grilled and basted in teriyaki glaze. served atop jasmine rice and sesame veggies. Our guiltfree grill is custom designed for todays modern, health conscious diner…. Don’t fear, we have taken every measure to still ensure great taste. salmon filet seasoned in white wine and lemon butter then delicately grilled and served with steamed seasonal veges. we take our juicy 12oz NY strip and trim off all it’s excess fat and then grill it to perfection. served with grilled mushrooms and black beans. Pick your sauce – Hickory Smoked BBQ, Chipotle BBQ or Honey Garlic. a full rack of our tender, juicy ribs uniquely marinated in fruit juices, ‘double basted’ in our signature sauce and served with crispy TROTTERS Fries and homestyle slaw. 8oz choice filet topped with a wild mushroom cream sauce and served with chef’s vegetables and your choice of mash potato or TROTTERS fries. chicken breast char broiled with a teriyaki peanut sauce. served with steamed rice and sesame veg topped with crushed peanuts. delicious grilled chicken breast basted with our in-house jerk marinade and served with black beans, rice and fried sweet plantain. juicy grilled mojo styled chicken breast served with caesar salad, rice, cuban black beans and fried sweet plantain. 3 delicious char grilled chicken breast basted with our signature sauces, bbq, honey garlic and jerk, served with cole slaw and crispy fries. a half rack of our delicious, tender baby back ribs served with twin chicken breast filets and accompanied with fries and homestyle slaw. caribbean styled strip steak grilled with ‘chimichuri’ sauce and topped with chopped onions, served with rice, black beans and fried sweet plantain… this one made us famous! our juicy 12oz center cut NY grilled to perfection and coupled with chef’s sautéed vegetables and your choice of TROTTERS fries or mash potato. harissa spiced lamb, grilled to perfection and presented with cous cous and a cooling cucumber mint yogurt. Baked fresh apples with cinnamon crunch topping served warm with vanilla ice cream and caramel sauce. Vanilla ice cream scoops topped with all your favourites! Hot fudge, caramel, nuts and whipped cream. 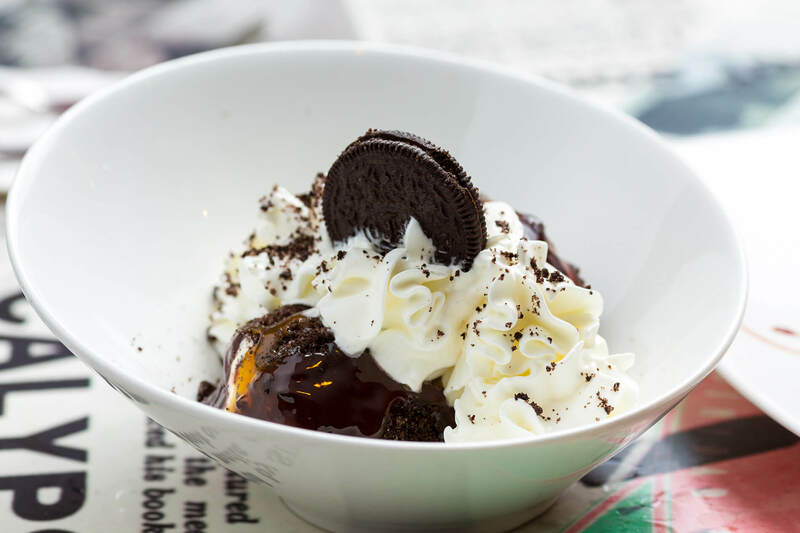 2 giant balls of oreo crusted vanilla ice cream, smothered with hot fudge and caramel sauce. Homemade, thick fudge brownie topped with vanilla ice cream and covered in hot fudge, nuts and whipped cream. ALL FOOD ITEMS ARE $40.00 AND INCLUDE REFILLABLE FOUNTAIN DRINKS! If you love cheese!! This is it! 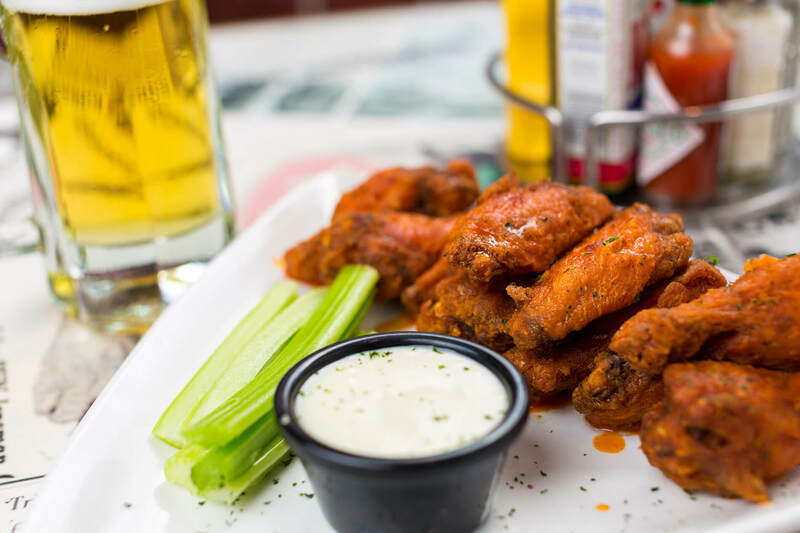 Our original Buffalo Wings with a little less heat! Vanilla Milk Shake with crushed Oreos!